Believe it or not, but Lionel Messi has yet to break every possible record. That's right, he doesn't own the world of football just yet. Joking aside, there is one man that used to play for Barcelona that still holds one; a record that "La Pulga Atómica" can still claim as a part of his ever growing list of impressive achievements. Perhaps it's not a statistic that is in the forefront of Barcelona's record books, nonetheless, current Southampton manager and former Dutch international and Barcelona midfielder Ronald Koeman has recorded a record 25 goals from free-kick situations for the storied Catalan club, a tally Lionel Messi can equal with just 4 more goals from similar circumstances. 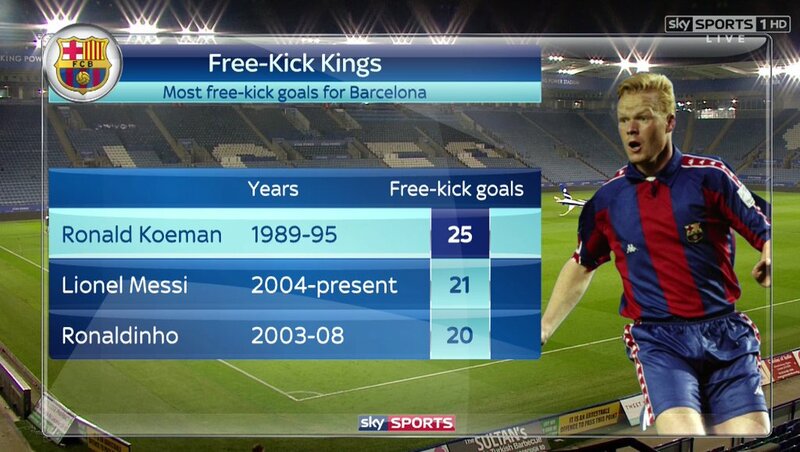 Some may argue that Koeman has achieved this impressive total in just 6 years with Barcelona, while Messi has been with the club double that time by now, but those that look deeper and are more familiar with Messi's tenure at Barça will quickly note that the Argentine forward joined the club at a very young age and was not one of the first choices for free-kicks until about 2008. Nonetheless, a record of totals is such that is remembered for the tally and the record breaker; not so much the time span it took to achieve it. So, watch every Barcelona free-kick closely, as Messi is not only very likely to surpass Koeman's mark, but also very often provides us football fans with some incredible goals from dead-ball situations.